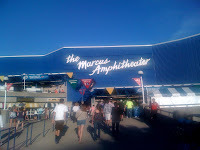 On a frigid day like today, I prefer to think about warmer activities, like going to the beach and attending Summerfest 2012! Summerfest will be here before you know it and Summerfest Marcus Amphitheater tickets are already available. Two headliners have already been announced for this year's Summerfest; Lady Antebellum on June 30th and Neil Diamond on July 8th. Lady Antebellum has performed in the Milwaukee area in recent years and are a staple in every country music fan's life. Neil Diamond, who was honored at the Kennedy Center Honors earlier this winter, will be celebrating his long and successful music career on his summer 2012 tour. Don't miss your chance to see these exciting Summerfest shows at the Marcus Amphitheater this summer. Speaking of Summerfest, I cannot wait to have some eggplant strips while waiting in line for the glider.